Two fish tacos, no combo, no drink. To go, please. “What’s your name?” she asks with her finger hovering above the keypad. “Nathan.” She leans forward and raises an eyebrow. “Nathan,” I say a little louder. She hesitates and enters the name to finish my order. I have had plenty of gringos mangle my name too. It is pretty hard for them to spell out xoloitzquintle. Your just reignited my long unfulfilled cravings for a good fish taco and/or fish burrito from rubios (or anywhere else for that matter). You can get almost any kind of food in NYC, except for a good fish taco. BTW, how did your meeting with the NPR people in shorts go? Thanks. I’ve still got a lot of things to tweak, but it was time for a new look. I clicked the more button from the RSS feed, then I had to explain to Anna why I was laughing at a receipt. Ditto on the layout, looks great. also digging the new layout. and nice job blending the content whitespace into the header. feels natural. this could be the last reason i need to finally host and converge my free blog with my widgets page onto something like Fjords01. Hah! 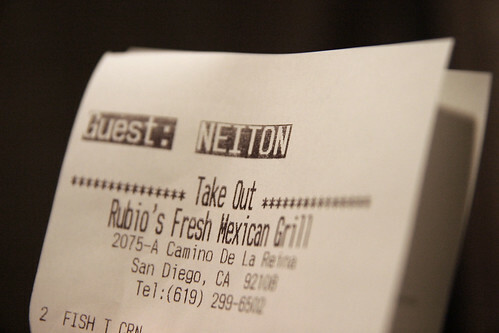 It took me a second (sorry, I’m slow today) to realize that Neiton was supposed to be Nathan. I’m lucky to have a name that’s not mangled too often. I have a friend who calls her self Linda at coffee shops because she doesn’t feel like having her Chinese name mangled first thing in the morning. That’s awesomely funny. So few words and an image to make people laugh…awesome.